You remember how I downsized from a 3 story Victorian semi-detached house to a 1930's cottage when I moved to Vancouver last year? And how with that downsizing went a LOT of paring down of furniture? I live fairly lean now - not that the place is sparse and bare of furnishings - although I do like the minimalist look, minimalist in this small home would mean NO furniture at all. For me lean means that anytime something comes in, then something MUST go out. But I do have a FEW "holes" so to speak, here and there. None of the big stuff - I couldn't fit in another table or couch or chair if my life depended on it. And I recently bought some art so the wall space is full (another post on the new art is coming up soon - promise!). I DO need a lamp or two. I have the recessed lighting and the floor lamp - I need a few table lamps as well. Trust me, a variety of lighting makes ALL the difference in any room. When I was in Toronto last month I made the rounds of a few decor shops. Couldn't visit them all - not enough time! There are SO many marvelous places to shop for vintage furniture in Toronto - some of THE most well-curated spots. I just KNEW that I'd find something PERFECT at one of my favourites - Zig Zag. It's on Queen East in Leslieville, a mecca for design shops. 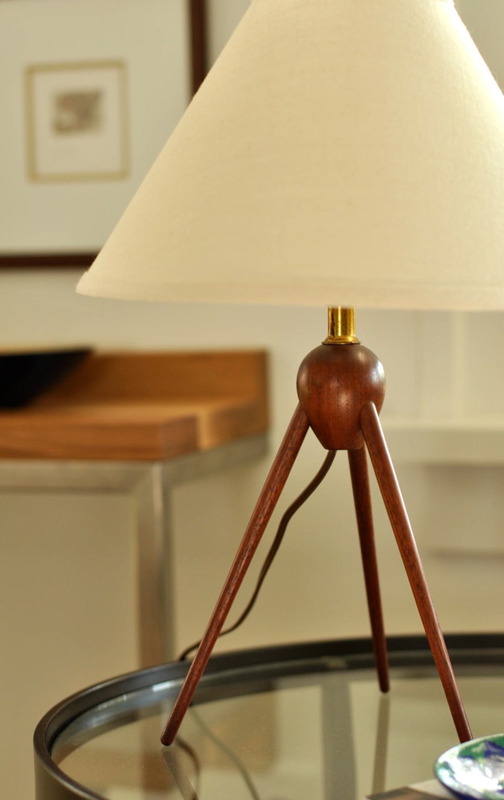 Owner Joe Graafmans does a marvelous job of finding THE best 20th century furniture and decor items. He KNOWS his stuff. I have to be honest here, my friends. When I zoomed in for a quick look, I REALLY didn't have anything in particular in mind but I DID know that I'd see lots of lovely things. If I ONLY had more room. Or a second house to furnish. Don't tempt me! You can definitely find larger shops but you'll be hard-pressed to find one of any size with such an amazing collection. There's no need to hunt through thrift shop cast offs to get to the good stuff - Joe has done ALL of that work for you. It's all wheat with no chaff. And the turnover is quite quick - you need to visit often. 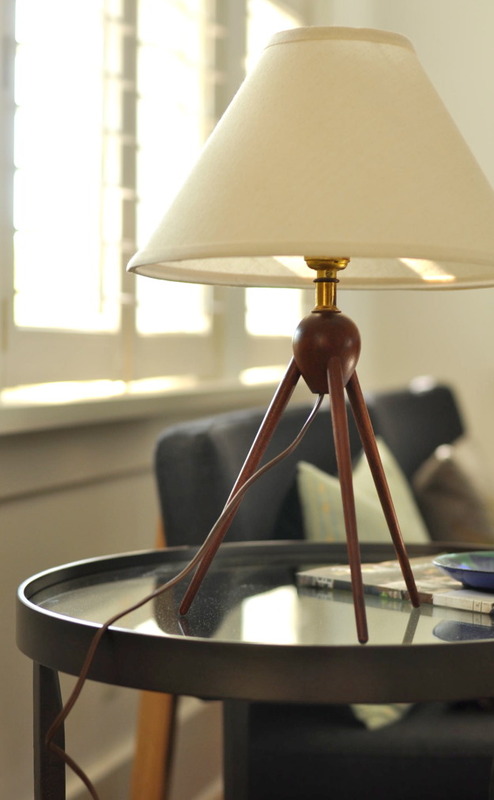 This tripod lamp caught my eye. The man found the metal dish. (Do you read Anthology Magazine? You should!). Joe wrapped it up (actually two of them - I couldn't leave its twin behind!) and we tucked them into our carry-on luggage. Excuse the dust on the glass table. See, how aspirational is that? A real life dusty table! Take that you critics of lifestyle blogs - it ISN'T all about being perfect. I only purchased the bases so when I got home, I went to a local lampshade shop and bought two lampshades. 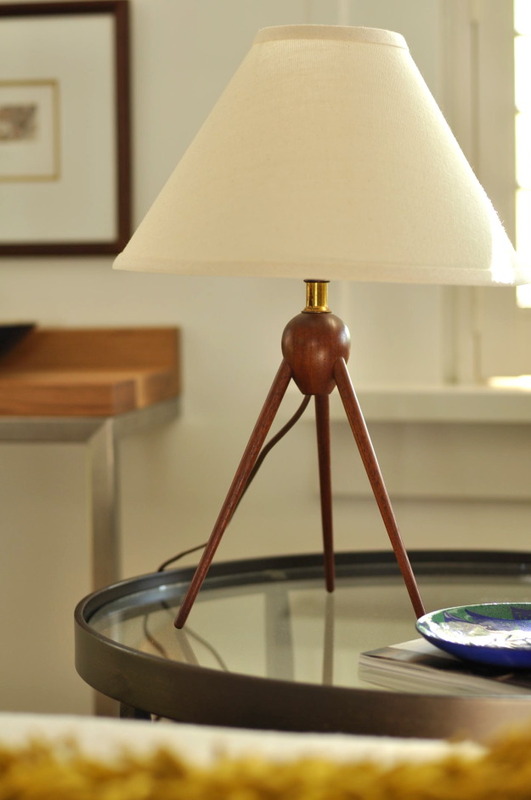 I love this little teak tripod lamp - and I just HAD to share it with you. How about you? Fan of lighting? Any fave vintage shops where you live?